The mystery of who Richard III really was has fascinated historians, readers and audiences familiar with Shakespeareâ€™s dastardly portrait of a hunchback monster for centuries.Â Earlier this year, the remains of a man with a curving spine, who possible was killed in battle, were discovered underneath the paving of a parking lot in Leicester, England.Â Phillipa Langley, head of The Richard III Society, spurred on by the work of the historian Michael Jones, led the team of who uncovered the remains, certain that she had found the bones of the monarch. When DNA verification later confirmed that the skeleton was, indeed, that of King Richard III, the discovery ranks among the great stories of passionate intuition and perseverance against the odds. Â The news of the discovery of Richardâ€™s remains has been widely reported worldwide and was front page news for both the New York Times and The Washington Post.Â Many believe that now, with King Richard IIIâ€™s skeleton in hand, historians will finally begin to understand what happened to him following the Battle of Bosworth Field (twenty miles or so from Leicester) and, ultimately, to know whether he was the hateful, unscrupulous monarch of Shakespeareâ€™s drama or a much more benevolent king interested in the common man. 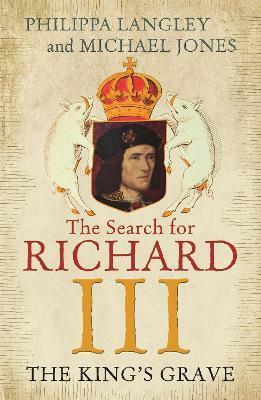 Written in alternating chapters, with Richardâ€™s 15th century life told by historian Michael Jones (author of the critically acclaimed Bosworth - 1485) contrasting with the 21st century eyewitness account of the search and discovery of the body by Philippa Langley, The Kingâ€™s Grave will be both an extraordinary portrait of the last Plantagenet monarch and the inspiring story of the archaeological dig that finally brings the real King Richard III into the light of day.